‘In the first half we played the way we wanted to play. We knew that the opponent was going to play with a reinforced defence. It was very hard to penetrate them, but at least we possessed the ball and created some chances that were not converted,’ Sredojevic told SuperSport TV after the game. ‘At half-time we saw what our problems were and allowed the fullbacks to go high up the field providing that edge that was the missing factor in the first half. ‘We have done exactly this with quick-fire goals with a two-goal lead that guaranteed us peaceful ending of the match. But how is it in football, we had chances and scored a goal that was disallowed that I believe should not have been disallowed, but that’s the decision of the referee we have to respect. 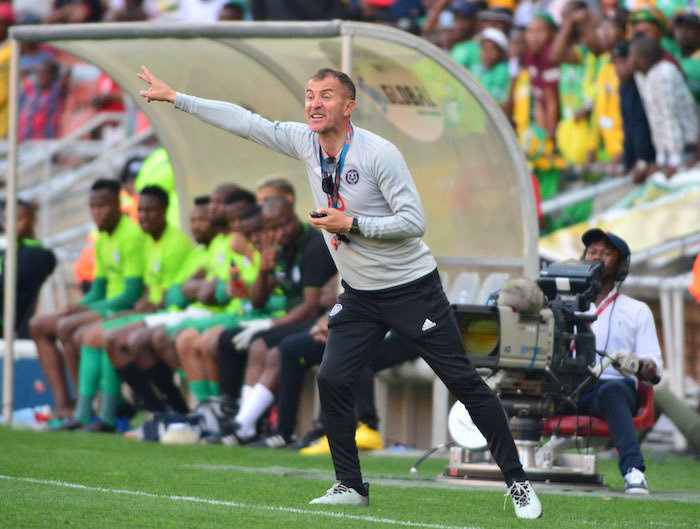 Sredojevic described his side’s last three fixtures as the ‘three doors of hell’ before they reached the ‘doors of heaven’ against Ea Lla Koto over the weekend. ‘I told them we need to open the three doors of hell. It was not easy playing against [Bidvest] Wits, winning against Black Leopards, and today to win. I need to give credit to the players,’ he added.